They might have been racing on a revised race course for the Ozzie Gladwin Canoe Marathon, presented by Parklane Super Spar, but the result was expected as Sbonelo Khwela and Siseko Ntondini ran away from the rest of the field while Christie Mackenzie and Kerry Segal won the ladies race on Sunday. Moving from its traditional home on the upper uMngeni River, the Ozzie Gladwin moved to the uMsundusi River this year and recent rains made the conditions ideal for the big field as they navigated the 20km from Camps Drift to the Bishopestowe Farmers Hall. 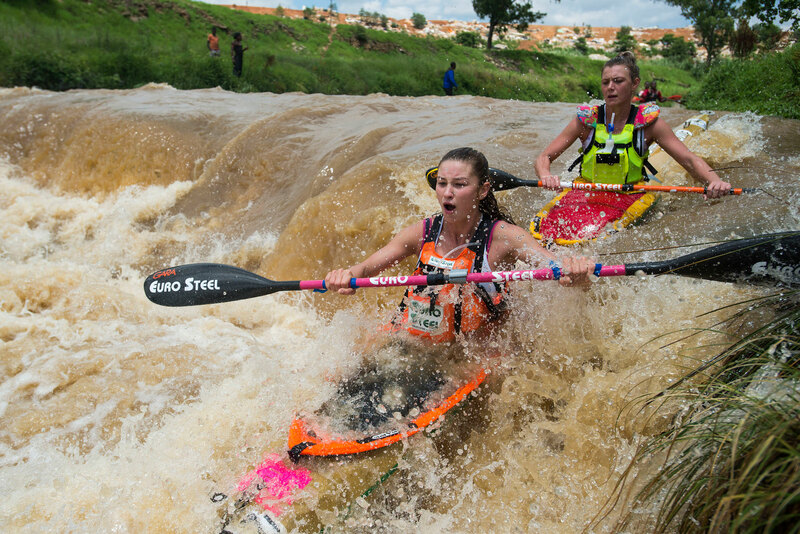 It was a well calculated race from Euro Steel/Red Bull’s Khwela and Euro Steel’s Ntondini as they maintained a solid pace throughout the race and made sure they took advantage over the final portage into the finish. “We kept up a good pace throughout and made sure that we were on the front bunch throughout the race,” the driver of the boat Ntondini mentioned. “On the run Sbonelo pushed me hard because running is a bit of a weakness for me so it was tough but was great to get a win this early in the season. “I really had to up my speed on the run because the boat kept sliding on my shoulder as Sbonelo kept running faster and faster,” he chuckled. Everyone knows Khwela’s running prowess and he was satisfied with the early season result. “I was happy with how our run went as we haven’t really had a lot of time to train together and we have only run with the boat once so far,” Khwela explained. It was a case of the young and the old for the other two podium spots with the experienced duo of Jacques Theron and Thulani Mbanjwa taking home second spot while the Under 23 duo of Stewart Little and Khumbulani Nzimande finishing in third. The ladies race was an exciting affair despite the early break-away from the make-shift pair of Christie Mackenzie and Kerry Segal, who took advantage of the flat laps around Camps Drift. The pair managed to get ahead and stay ahead all the way to the finish and despite the win, Mackenzie felt the pain of early season racing. “The calves are a bit sore because we haven’t really paddled together, we’ve only paddled in one race together but it was nice to see where we stand going into the season. “It’s a good wake-up call to get and it helps you realise how much work there is still to be done before Dusi,” Mackenzie stressed. 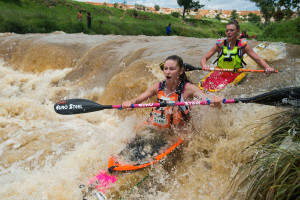 Segal will be pairing up with Kyeta Purchase for the FNB Dusi Canoe Marathon and Mackenzie will team up with Bridgitte Hartley which will mean the ladies race is going to be an exciting showdown come February. Completing the podium in the ladies race was the junior pair of Amy Peckett and Caitlin Mackenzie and the Peek sisters, Jordan and Cana, in second and third respectively. 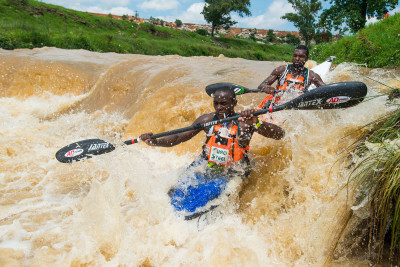 Six-time FNB Dusi champion Andy Birkett is also currently in the build-up for the Dusi and with his partner away he teamed up with Jenna Ward for the Ozzie Gladwin and the duo paddled to victory in the mixed doubled category.